Contact our serialization specialists and get their full support in discussing the EU Falsified Medicines Directive and its implementation. Reliable serialisation and labeling systems for the manufacturers of pharmaceutical products can put an end to the very serious global trade in illegal drugs once and for all. With 2011/62/EU Directive, the European Union has brought the initiative to combat the life threatening counterfeiting of medicinal products irrevocably closer to victory. 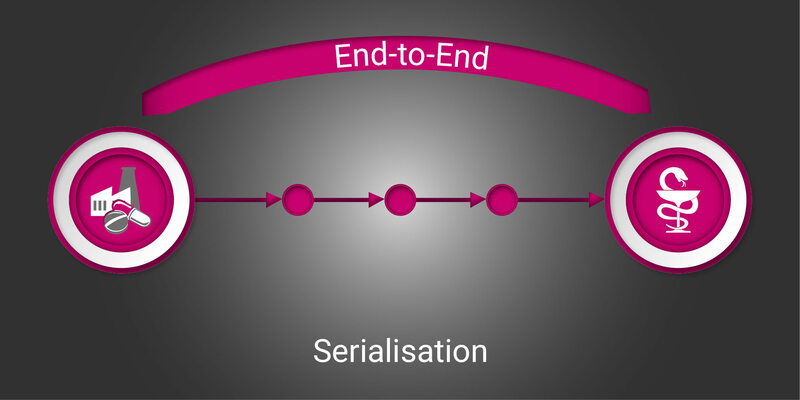 Result: Mandatory serialisation is coming! The prerequisite for safeguarding against falsified medicines is the assignment of a unique serial number linked to the individual production data (product identification GTIN/NTIN/PPN, expiry date, and batch number) in the form of a Data Matrix Code. The distinctive "branding" by the pharmaceutical industry in conjunction with sealed labels on the packaging ensures the authenticity and integrity of a drug unit and protection from tampering. Traceability is an essential key to safe drugs and the basis for absolute confidence on the part of the consumer in the pharmaceutical industry and its products. There is still no global standard for consumer protection regarding prescription medications. To date, only separate drug safety initiatives have been launched by various nations. Turkey, for example, is thought of as a pioneer and, since 2010, has had legislated controls of the complete supply chain. Brazil, China, South Korea, and USA have also enacted specific laws for tamper-evident drugs to give consumers more protection. 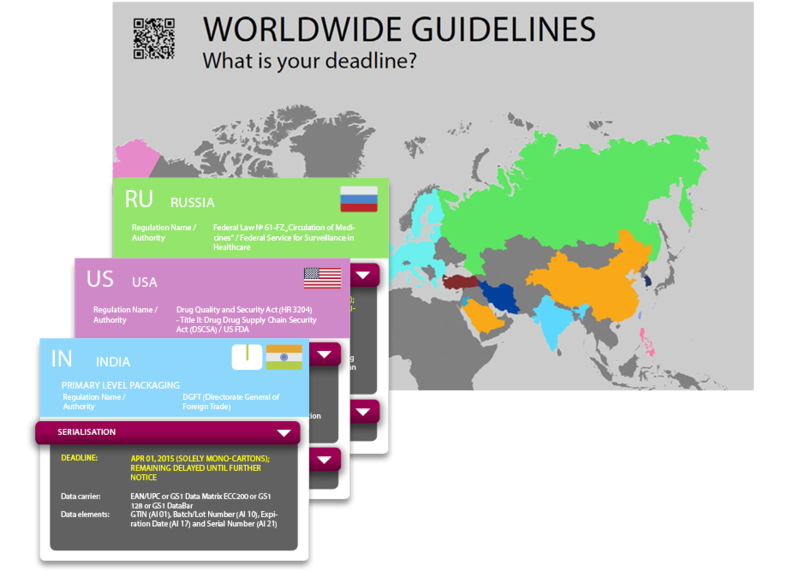 The majority of countries in the rest of the world are currently working on more binding legal texts, which heralds the start of the hot phase of implementation running up to a fixed date. The European Union's Directive 2011/62/EU provides a catalog of measures which are intended to prevent falsified medicinal products from entering the legal distribution chain. Since the Treaty of Lisbon (January 1, 2010), the Commission has had the authority to issue declarations that must be implemented throughout Europe in the respective national laws within three years. In autumn of 2015, in the context of just such a declaration, the EU Commission issued the essential technical details for the design of safety features for drug products. The delegated act is scheduled for publication in the Official Journal of the European Union in the first quarter of 2016. The 2011/62/EU Directive firmly regulates that, in the future, all prescription drugs must have safety labels that enable verification checks along the entire supply chain. In effect, all stakeholders, from the pharmaceutical companies and their contract suppliers to the market wholesalers and the retail pharmacies are involved in this implementation. Counterfeit drugs can then be identified immediately and safely withdrawn from circulation. The design of a solution that complies with the legal provisions regarding tamper proof prescription drugs is a complex project in any case and presupposes the implementation of a reliable Track & Trace system. Furthermore, the packaging processes must be adapted for additional printing and labeling. As serial numbers differ from pack to pack, the boxes have to be printed during the packaging process in the production lines. The unique serial numbers required for assignment must first be generated and then merged with additional product data in a Data Matrix Code. The guarantee of uniqueness is absolutely key because verification necessarily demands that each serial number occurs only one time. The accumulating volume of data has to be centrally stored in cross-company databases. Also worthy of note are the economic challenges faced by the effected companies: budgets for new or replacement investments must be provided and the time and resources for implementation efficiently planned. From the planning stage to full implementation of a Track & Trace system, a period of at least 2 years is considered appropriate. Specifically, this means: Any drug manufacturer or contract supplier that does not intensively come to terms with this topic now, risks serious consequences in the future - from delivery delays to the complete inability to deliver. Do not let that happen! Serialisation encompasses the end-to-end application and the data technology to generate and record serial numbers during the manufacturing process. When the pharmacist, as the last link in the value chain, sells a prescription medicine to a patient, the package code is read in the pharmacy and sent to a central data base to be checked and verified. The Track and Trace solution includes any additional information generated at each packaging step during the various aggregation levels in the distribution chain and records it in the corresponding code sent to the central database. The complete supply chain is traceable, transparent, and secure. To facilitate German drug manufacturers in implementing a practical and realistic solution, diverse pharmaceutical associations, the wholesalers association, and association of pharmacists joined together to form securPharm. The aim of securPharm is to promote the development of a serialisation system that can be own and operated by the manufacturers. The verification system subsequently developed in the context of securPharm meets the requirements of the EU Directive and already allows the companies to label selected drugs and subject the technical platforms to practical testing before the legal provisions go into effect. 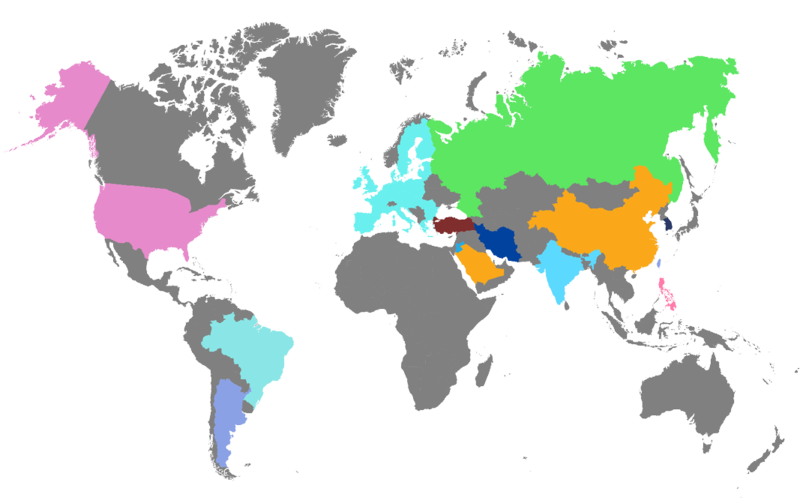 As a global player, WIPOTEC-OCS maintains very close relations with various national associations. These relationships allow us to act in an advisory capacity on request and at the same time communicate the most recent legislation and any modifications at the earliest possible moment. Given the global nature of the need for serialisation solutions and, considering the rather limited number of suitable suppliers in the market, the falsified medicines project can be seen as a very special challenge in terms of achieving the optimal consumer protection. Members of the U.S. drug supply chain requested that Congress create a law that would govern the identification, management, and traceability of all prescription (Rx) drug products within the United States in 2013. The 2013 Drug Supply Chain Security Act (DSCSA) aims to facilitate the exchange of information at the individual package level about the legitimacy of a drug in the supply chain. This process of Serialization is geared to verify and identify, not only on a unit level (e.g. carton or bottle), but as well as the packaging level (e.g. shipper) of the drug. DSCSA enhances the detection and notification of illegitimate products in the drug supply chain, and facilitates more efficient recalls of drug products. 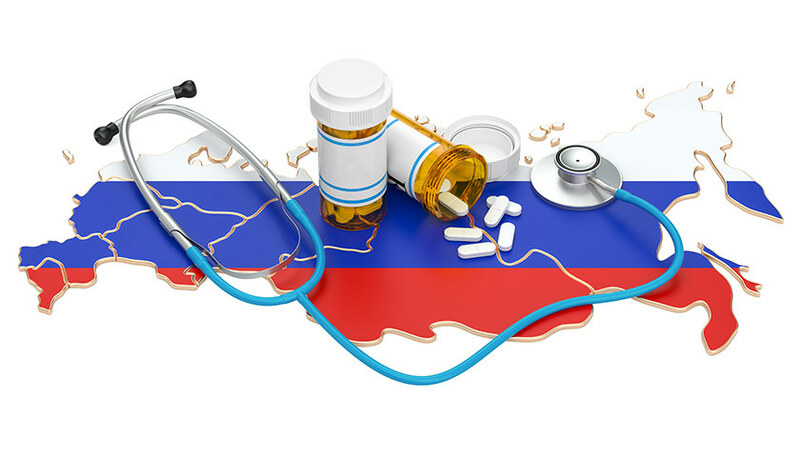 The FDA enforced compliance regulation for the US and all other international ones, represent a significant challenge for every pharmaceutical supply chain partner from manufacturer to the pharmacist. It is through the creation and subsequent usage of serialization data, that manufacturers have the ability to gain real-time, end-to-end visibility, traceability, and control over orders and shipments as they move through the supply chain. November 2017, is the date that manufacturers must serialize. This is required by the Drug Supply Chain Security Act (DSCSA) which applies to the USA. Pharmaceutical companies producing for export and pharmaceutical contract manufacturers must comply with DSCSA regulations in order to continue selling their products in the world's largest market for pharmaceutical products. Since 30 June 2017 an important change has applied: FDA will grant a transitional period until 11/2018. In a draft directive issued by the FDA to manufacturers and other stakeholders in the supply chain for prescription-only drugs, it is explained that the prosecution and sanctioning of non-compliance with the statutory requirements, which was due to take effect from the changeover date in November 2017, will be suspended by one year. The changeover date originally scheduled will remain but the FDA will grant a transitional period until 11/2018 during which no sanctions will be imposed. The reason stated for the change is that manufacturers are to be given more time to implement the serialization requirement technically. Postponing the date is also intended to prevent disruptions to the supply chain. As a starting point, our serialisation experts have brought together for you, in a compact and comprehensible form, all relevant data such as national regulations against medicine counterfeiting, underlying coding requirements, implementation deadlines and evaluations of the market situations in relation to future developments. You will find all this information in interactive form and simply structured on the TQS map. All global serialisation requirements at a glance - compact and comprehensible. You can download the TQS information graphic as a PDF and print it out; please feel free to distribute it as well. The Traceable Quality System (TQS) from WIPOTEC-OCS is the ideal implementation of Track & Trace. The system provides maximum flexibility in ensuring the continuity of the serialisation right up to the last level of aggregation. TQS is easy to use and a single software interface offers convenient operation. WIPOTEC-OCS offers both solutions for folding cartons as well as bottles and vials. Machine readable codes that ensure a globally unique product classification in the form of a serial number combine with a tamper evident label on each individual pack to form the basis for consumer protection against counterfeit drugs. Serialisation and continuous aggregation ensure transparency of product origin all the way to retail sale and create trust and security in the market. The serialisation of individual boxes begins with the stable positioning on receipt from the cartoner. The labels are then applied as required to the front or back side, or the top of each folding box. Thanks to the compact design of the labeler, a tamper evident label can be applied to prevent illegal opening of the original box. The TQS top conveyor system transports the folding boxes from the cartoner and has demonstrated maximum flexibility in adapting to the most varied of folding box dimensions. The series of machines in the Traceable Quality System (TQS) provides a format independent aggregation for all packaging levels (sets, cartons, palettes) tailored for the individual requirements of every customer. 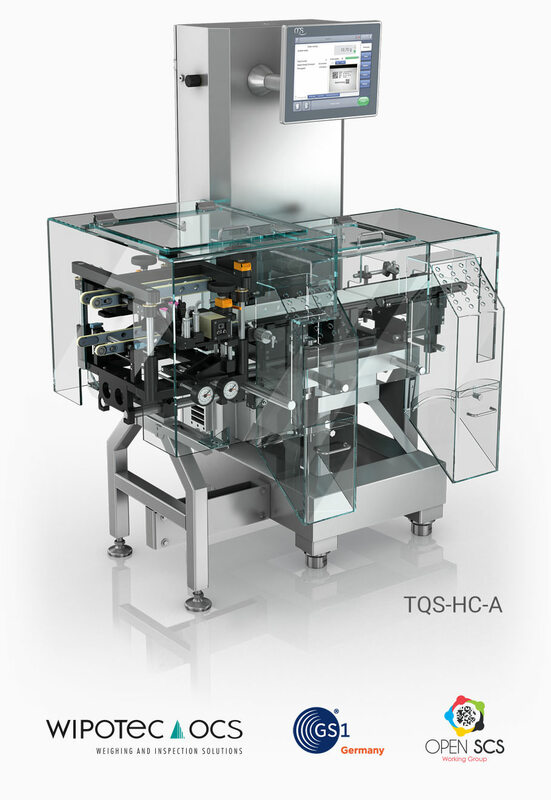 TQS enables the consolidation of the serial numbers of multiple individual packs into a separate unique serial number for the set in addition to semi-automatic aggregation of manually repacked cartons, where the operator places previously aggregated sets lengthwise into the shipping carton. The operator conveniently assigns the units from a lower packaging level (e.g., folding box) to a higher level (e.g., sets or shipping cartons) and, in this way, creates the hierarchical relationships in the database. TQS is perfect for the implementation of all levels of aggregation and the seamless traceability of the entire supply chain with great flexibility ensured for the each component for packaging and final packing. All serialisation and aggregation systems can also be integrated as OEM solutions into already existing processes required for packaging or labeling systems (e.g., for bottles and cans). TQS is an intuitively operated system, which combines the greatest possible flexibility with easy handling. The special advantage: product handling, coding, and video inspection via camera are all controlled from one interface. This simple operation is unique! While the information to be printed is sent to the printer, an expected print image is, in parallel, also sent to the camera. This eliminates the sometimes cumbersome setup of proprietary hardware. In this case, the camera already has the exact pixel information about the print image and there is no need to prepare an extra printout or proof copy. TQS stands for reliable and easy operations. The supplier works with just one system, fully integrated and centrally managed via a single HMI. TAKE ADVANTAGE OF THIS OPPORTUNITY! SERIALISE YOUR PRODUCTS NOW! TQS enables the serialization of folding cartons by printing the side tabs or top side. A completeness check by means of weight detection can, for example check boxes on inserted instruction leaflets or broken tablets / tablets number. Ejection of missing or incomplete packaging. Integrated Tamper-Evident for tamper-proof locking. As well as Country-specific label application for worldwide use. Format-independent aggregation of folding cartons of the first aggregation stage. TQS provides the summary of the serial numbers of the individual packs to a serial number for the bundle. Fully integrated lab printer including camera control. Semiautomatic aggregation on shipping carton level. Handscanner to query and change the aggregation hierarchy. The TQS solution (TQS-SP-Bottle) for bottles and vials prints these with auxiliary codes. The codes that are only visible under UV light are printed on the bottom of the bottle or lid. Pre-serialized bottle or vial labels are verified. The auxiliary code is used for aggregation in bundles or cartons. Several ultrafast cameras control optical coding, layout or plain text. The TQS solution (TQS-CP-Bottle) for integration into production lines of bottles or vials separates cylindrical containers for 360 ° round-the-clock inspection and performs the omidirectional verification of the previously serialized labels. Products are collected up to the target quantity of the carton and then handed over to the packaging. Unreadable or invalid serial numbers lead to the ejection. With TQS, WIPOTEC-OCS has a flexible, modular track & trace system that has been perfectly tailored to our needs. […] We are optimally prepared in relation to future global track & trace requirements with TQS. […] It is a major advantage that it is no longer necessary to set-up the individual print layouts and image processing separately in all TQS modules due to the fully integrated operating software ConfigureFast. Extremely short changeover times are the result and as a consequence significantly higher productivity on the line. With TQS we are optimally equipped in relation to consistent serialisation and complete aggregation. In particular, due to the quality and flexibility of our space-saving system, we do not need to be concerned about any of the global marking requirements to be expected in relation to future export to the Far East. WIPOTEC-OCS is a solution provider to GS1 Germany and also a voting member in the GS1 Global Healthcare User Group. We cooperate with the major pharmaceuticals and immediately implement relevant targets and changes regarding serialisation and aggregation. As a member of the Open SCS Working Group, WIPOTEC-OCS advocates for flexible means of integration with existing production infrastructures and, in addition, for a philosophy of open and standardised links to higher-level systems. WIPOTEC-OCS fights for improved industry standards rather than proprietary island solutions, which are still used far too often: Specifically, the artificial dependence on many suppliers sooner or later leads to very risky availability bottlenecks. Each pharmaceutical player must be independent and able to freely choose their equipment. For more than 20 years, the weighing and inspection solutions from WIPOTEC-OCS have been the reliable standard for dynamic, fast, and highly accurate weight and completeness controls in the production lines of the leading producers in the pharmaceutical, cosmetic, food, and chemical sectors. Building on this experience with custom high-tech applications and with a view to the coming mandated serialisation for prescription drugs, WIPOTEC-OCS expanded its product portfolio with the very successful Track & Trace solution known as TQS (Traceable Quality System). TQS stands for top reliability and ease of use while providing all drug manufacturers a customised solution to meet the serialisation and aggregation requirements for medicinal preparations. The operation of the functional units for product handling, coding, and camera inspection is convenient and fully integrated in one software package. WIPOTEC-OCS attaches great importance on the development of all required technologies and the ability to manufacture all core components in-house. The result is an extraordinary manufacturing depth and expertise which allows us to be supplier-independent and forms the basis of our delivery reliability. Design, development and assembly are performed in-house at WIPOTEC-OCS. The philosophy of short chains is what ensures the greatest flexibility in implementing each individual product configuration. As an WIPOTEC-OCS customer, you benefit from our global service network. We provide support in implementing your customised TQS solution by offering instruction and training of your operators and by performing preventive maintenance of the units. We would be pleased to personally advise you about the details of the scope and effort of the individual services. Safe drugs are a valuable commodity which, in times of need, can ensure survival. Far from any economic consideration, this implies a pure ethical responsibility to undertake every effort to put an end to the global counterfeiting of medicinal products. WIPOTEC-OCS is very proud to meet these challenging tasks with a priority on supplying the best possible consumer protection. Our current customers include well-known, demanding pharmaceutical companies. 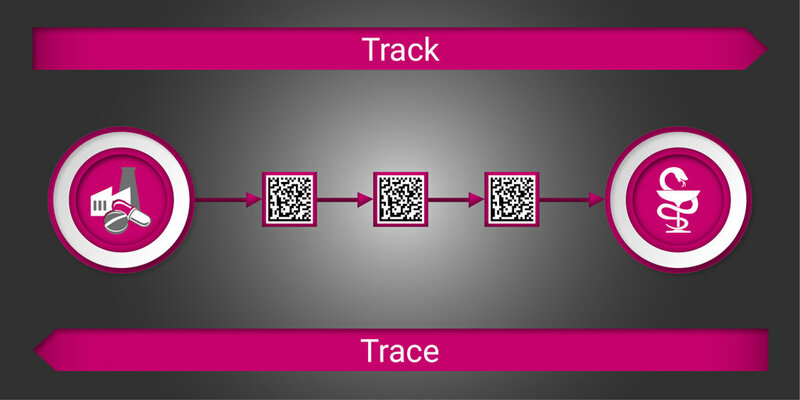 If Track & Trace is an important topic for your business, then please get in touch with us. We will give our very best to support you. After you have sent us the form, our Track & Trace experts will contact you without delay to discuss your enquiry personally. We would be pleased to answer any further questions, irrespective of whether the issue is country-specific planning or a specific project. You will receive from us an overview of our comprehensive product portfolio as well as application-related information on the usage of Track & Trace systems.